The inspiration for this card was the decorative papers that were a gift from my daughter. The bright colors just screamed "baby"!! 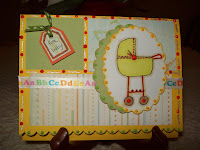 I used Stampin' Ups' Baby Talk set that I colored with my Copics. I used Marvy's scallop oval punch for the main image and offset it with another punched oval out of Certainly Celery. The Stampin' Up scallop edge punch was used along the bottom and I accented it with 3-D paint dots. The ABC ribbon was bought years ago and it was a must for this application. The "for baby" and the main image were set up on dimensionals to add depth to the card. I really like the way this one turned out and I hope you do, too!